Jesus taught with hands-on lessons and illustrations. The "Hands-On Bible" uses the same experience-based learning to communicate God's Word in an active, understandable way. 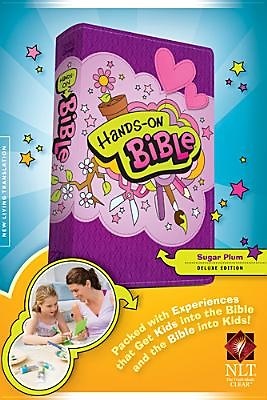 With hundreds of fun, memorable activities, the "Hands-On Bible" is packed with activities and experiences that invite kids to crawl inside the Scriptures and "do" God's Word! Exciting Bible features include 102 Hands-On Bible Experiences, 52 Key Verse Activities, 31 Bible Hero Biographies, 16 Bible Bonanza Experiences, 82 Jesus Connections, 66 Bible Book Intros, 69 Fun Facts, a Where to Turn When I'm . . . .index, kid-friendly Q&A, 28 full-color tip-in pages, and charts and maps. The family devotions and Bible reading plan content is available online at myhandsonbible.com, along with some downloads. Kids are sure to love this new design and the blue interior color!